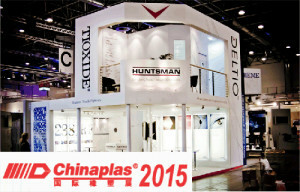 Wearable electronics, a fast rising sector, was the focus of Huntsman’s thermoplastic polyurethanes (TPU) business at CHINAPLAS 2015. According to ABI Research, the number of wearable devices for fitness and wellness applications will grow from 16.2 million in 2011 to 93 million in 2017. The last two years has seen the market for high-tech personal activity trackers and other health technology products explode. Numerous wristbands and smart watches now exist, many of which are made from TPU. “The growth of electronic health devices that monitor how active we all are has been phenomenal over the last two years and has had a really positive impact on the TPU industry,” said David Fu, Commercial Manager TPU Business APAC Polyurethanes at Huntsman. He revealed that some business discussions are underway, including a project with a market leader in the manufacture of activity trackers. At CHINAPLAS 2015, Huntsman showed a range of AVALON TPU products that can be used in the manufacture of smart watches and fitness trackers. Elastic, durable, and easy to color and print on, Huntsman’s TPU can be injection molded to create tactile, soft touch watchstraps. They can also be molded into specialist soles and inserts for running shoes. Huntsman also has a variety of IROGRAN TPU resins available that can be extruded into films for use in the creation of smart fabrics. Robust, yet highly flexible, the resins can be extruded to create TPU substrates to house printable electronic sensors. The films can subsequently be incorporated into sports clothing.